John has been in higher education facilities for over 35 years with five years at Northern Arizona University, seven years with the University of Colorado Boulder and 24 years at Colorado State University. John is a past RMA president, a past Senior-Senior Rep to the APPA Executive Board, and is currently Chair of the Credentialing Board and the Mentoring Committee. John has also served on several APPA FMEP teams. We have all heard the adage that the only thing constant is change. Not only is this statement accurate, but in fact, change and expectations of change are increasing exponentially. There are changes in customer expectations, changes in building systems, changes in information technology, changes related to building construction and building system performance, changes related to the environmental impact of our operations (including sustainability and energy), changes in security requirements, changes in reporting capabilities, changes in workforce demographics, and so on. In turn, access to the Web and e-mail has led to an increased demand for timely and accurate information. Facilities department and physical plant employees often see change management as something that is required of other departments at the college and university. Nothing could be further from the truth. In fact, failing to change with the times and new demands will doom the facilities department to mediocrity. To achieve the world-class service that many of us strive for, we must be willing to embrace change and prepare our organizations to do the same. The true challenge of organizational change lies not in the mechanics of making change, but in addressing the cultural norms that define the current organization. This begins with identifying the need to change and having the willingness to honestly examine every aspect of the organization. Management must be able to detect trends in the macro-environment, as well as the micro-environment, to be able to identify changes and initiate programs. It is important to estimate what impact a change likely will have on employee behavior patterns, work processes, technological requirements, and motivation. The program must then be implemented, disseminated throughout the organization, monitored for effectiveness, and adjusted where necessary. Change also will affect the individuals within the organization. People who are confronted by change will experience a form of culture shock as established patterns of the organization's culture are altered, or as staff view those patterns as being threatened. Effective change management requires an understanding of the possible effects of change on people, and how to manage potential sources of resistance to that change. Management must assess what employee reactions will be and craft a change program that will provide support as workers go through the process of accepting change. Change management includes both organizational change management and individual change management. Organizational change management includes processes and tools for managing change at an organizational level. Individual change management deals with understanding the people side of change. When combined, organizational change management and individual change management provide a structured approach to transitioning individuals, teams, and organizations from a current state to a desired future state. Once the facilities manager has identified and accepted the need to change, various concepts and processes will make the change effort easier to implement. When leading change, the facilities manager must understand the various roles of a change leader. Facilities managers must be able to develop and effectively communicate a shared vision with a strong sense of urgency. Developing a strong coalition and gaining departmental buy-in will help to overcome the normal resistance to change. It is critical that the facilities manager understands their work place culture and anticipates resistance to change or any gains may quickly revert back to the old norm. To effectively implement change, the facilities manager must have an obsession with quality, and this obsession must become part of the facilities organization’s culture. The facilities manager must embrace the concept that quality leadership starts with the customer. In turn, the organization’s goal should be to meet and exceed customer needs. Quality organizations encourage teamwork in order to foster a sense of unity in purpose, and everyone within the department must understand that work always has some form of structure. By embracing quality service as the “norm,” following prescribed procedures for process improvement, and effectively utilizing teams, the facilities organization can ensure a successful change program. There is a difference between change management and change leadership. Managers are responsible for planning and establishing budgets, organizing and staffing, and controlling and solving problems. Leaders establish direction, align people and resources, and motivate and inspire. Managers tend to be goal oriented, focus on the current state, and generally control risk. Leaders are visionary and mission oriented, future and change oriented, and risk takers. One analogy is that managers focus on climbing the ladder, while leaders question whether the ladder is leaning against the right wall. Therefore, leadership is critical to the success of any change initiative, and it requires a change leader or change agent. Someone who leads the charge; someone with the strength and courage to initiate change; someone who can see the vision; someone who can lead the implementation plan to fruition; someone who can set milestones; someone with the authority or empowerment to make necessary adjustments; someone who can inspire the “troops”; and someone who can respark the team when morale gets low. To be an effective change agent, the facilities leader must fill various roles to guide the change process. At times the change leader will need to act as a director, guiding the organization in particular ways to produce the required change. The change agent will need to take on a navigator role, carefully moving through the various complexities that arise from controlled and uncontrolled outcomes of the change process. At other times, the change agent will need to function as a coach, reinforcing the values and skills required for the organization to achieve the desired outcomes. The change agent must be a caretaker, supporting the organization through the change process. Change in some areas may inadvertently create change in other areas, so the change agent must be a caretaker for the entire organization, not just for specific areas that have planned change. The change agent will need to act as an interpreter, helping the organization make sense and meaning out of the various events and actions that constitute a changed organization. Often, a change agent will need to act as a nurturer. As in a parent’s relationship with a child, future outcomes are nurtured and shaped. Lasting change must emerge and cannot be produced instantaneously. Most important, the change agent will have to perform as a motivator. The organization will need motivation to begin the change process, and it will need to be reinfused at various points during the change process. Lasting change takes time and energy. After working for a few years with no immediate end in sight, it is natural for people to feel tired. The change agent will need to motivate teams to stay focused and continue on track. Change agents need to ensure support and active involvement from top and mid-level management. Active leadership of top management is crucial for effective change management. The most frequent cause of failure of any change effort is uninvolved or indifferent top and mid-level managers. Top managers must be actively involved, demonstrate their passion for the change effort, effectively communicate those goals, and assist or guide the implementation process to ensure lasting success. Quality cannot be delegated to others. Developing a strong coalition, with active support from top and mid-level management, is necessary to overcome the sources of inertia that resist change. Often top and mid-level managers will also become the organization's change leaders, so they too will need to understand the various change agent roles. Change agents need to create a sense of urgency. By far the biggest mistake people make when trying to change organizations is to plunge ahead without establishing a high sense of urgency in fellow managers and employees. This error is fatal because transformations always fail to achieve the objectives when complacency levels are too high. Without a sense of urgency, people will not give the extra effort that is often critical, they will not make sacrifices, and they will not be willing to leave their comfort zone. When establishing a sense of urgency, the change agent must overcome the common perception that the status quo is not bad. When the organization does not see that a highly visible crisis exists, the change agent must be able to define the driving force behind the need to change and describe the benefits of improving. Long-term change and creating a change culture is a process that requires dedication, patience, and persistence. Facilities leaders and change agents must master these qualities. Declaring a victory to a major change too soon can fail to bring about desired results. New approaches are fragile and susceptible to regression. In turn, declaring defeat during the middle of a long-range change process can frustrate employees and discourage the organization from future attempts for change. People who have been through difficult, painful, and unsuccessful change efforts often end up pessimistic and angry. True, lasting change will succeed only if new behaviors become rooted in the organization’s social norms and shared values. Vision plays a key role in providing useful change by helping to direct, align, and inspire the actions of large numbers of people. Without the appropriate vision, a transformational effort easily can dissolve into a list of confusing, incompatible, and time-consuming projects that go in the wrong direction or nowhere at all. As Stephen R. Covey states, effective leaders must start with the end in mind. All things are created twice: first mentally, then physically. Organizations and teams shape their own future by creating a mental vision and purpose of any project. Creating a culture behind a shared mission, vision, and values is the essence of leadership. Envisioning the various steps required to bring your vision to fruition will provide the clarity needed to guide the implementation team. The extent to which leaders begin with the end in mind often determines whether or not they will be able to create a successful enterprise. A strong vision serves three important functions. First, it sets the general direction for change. Second, it motives people to take action in the right direction. Third, it helps to coordinate the actions of different people. Clarifying the direction of change is important because not everyone may agree on the direction. Some may be confused, or may fail to see the need for change. A clear vision will describe what is leading the need for change and provide compelling reasons for the need to meet those changing demands. The vision facilitates change by motivating action that may not be in people’s short-term interest. Change often involves some sort of pain, such as more work, learning new skills and behaviors, and moving from the norm or comfort zone. There is a natural inclination to deny the future, so an appealing vision can motivate individuals to explore the unknown. The vision is also effective at aligning individuals and coordinating their efforts toward a common goal. With a clear sense of direction, motivated people can perform in remarkably efficient ways. A clear and effective vision has six key characteristics. First, it describes some activity or organization as it will be in the future, and conveys a picture of what the future will look like. Second, it portrays a set of possibilities that is in the best interest of those who have a stake in the situation. It appeals to the long-term interests of employees and customers. Third, effective visions are realistic and attainable. Pie-in-the-sky visions fail to capture the interest of those who need to be involved in the implementation process. Fourth, good visions should be clear enough to motivate, and focused enough to guide decision making. Fifth, effective visions should be flexible enough to inspire initiative, or to allow for alternatives in response to changing conditions. Finally, effective visions should be easy to communicate. A vision that cannot be articulated clearly will fail to fulfill the other five key characteristics. Vision alone is not sufficient to accomplish effective change. A vision is more than a pipe dream, so the leader must have some idea of the road map or an implementation plan required to achieve the vision. Without a strategy for change, the vision is only that, “a vision.” This does not mean that every aspect must first be defined in detail, but identifying and developing the resources needed within the organization is a need that should be considered early on in the improvement process. Before implementing change management efforts, questions should be considered, such as the part of the organization in which the transformation should start, the potential projects that have the best chance of success, the resources needed, the individuals who will provide guidance and technical support, the individuals who will coordinate logistics and communications, and the possible need for external support. Taking the time to consider the answers to these questions will ensure successful implementation. A common mistake is to involve too many people too soon without considering the supporting structure to ensure their success. Failure to consider this concept can create frustration and dampen enthusiasm, with dismal results. James M. Kouzes points out that, with the importance of being future oriented, some leaders developed a sense that they had to be the visionaries. Exemplary leadership is not about being a prophet uttering divinely inspired revelations. Developing a vision does not have to be a top-down process. To develop a shared vision, leaders need to engage others in a collective dialogue about the future. The collective dialogue must ask the right questions. These questions should include both effectiveness and efficiency. Our jobs as educational professionals and organizational leaders depend on this knowledge. Common effectiveness questions include the following: Are we doing the right things? Are we asking the right questions? Are we tackling the right problems? Are we working on relevant issues? Are we making the right investments in facilities operations? Are we making the right investments in our buildings, infrastructure, and programs? Are the customers satisfied with the space and services? Are we doing effective measurements? Are we building a staff that can sustain excellence? Common efficiency questions include the following: Are we doing things right? Are we taking unnecessary steps? Do we have redundancy? Are the operating funds that we receive being spent in a way that best supports desired outcomes? Do we have efficient work processes? Developing a shared vision allows others to share in the thrill of seeing a new state, inspires them to willingly apply extra effort, sparks their initiative and ingenuity, and creates a synergy that can help overcome the natural resistance to change. A shared vision empowers employees, develops a sense of ownership, and stimulates self-directed actions. The shared vision is more likely to encourage “buy-in” and can inspire the organization to make it their mission to achieve those goals. A shared vision is a powerful force that the change leader can effectively utilize to inspire a change-oriented culture. There are a variety of methods to develop a shared vision. One method is a strategic planning session among the organization’s leaders. This strategic planning session often involves developing a mission statement, and defining the organization’s guiding principles and core values. The process includes reviewing the organization’s strengths, weaknesses, opportunities and threats, commonly referred to as a SWOT analysis. The ultimate goal is to enhance the organization’s strengths in order to overcome its weaknesses, and to capitalize on the opportunities to the extent that they minimize the threats. The outcome is a shared strategic plan that can guide the change process. Another popular method is referred to as “sensing sessions.” Sensing sessions allow participants to speak freely and openly, and can be a useful forum to discuss effectiveness and efficiency questions. The sensing session format that discusses the effectiveness and efficiency questions can help to identify what needs to be kept and what needs to be changed. A sensing session approach can help to develop interest and action from employees across the organization, while breaking down some of the distrust that may be felt at the beginning of the change endeavor. Change leaders may initiate the strategic planning process or sensing sessions, or change agents may emerge throughout these processes. Once the organization has developed a shared vision, it is critical for the change leader to get buy-in, share the vision, and create emotional acceptance. It has been said that people do not resist change; they resist being changed. It is important to provide regular communication and involve people at every step of the process. Because transformation is a campaign, leaders need to win people’s hearts as well as their minds. The best change occurs when people as a group accept it. It is critical to talk to the people who will be affected by change whenever possible. Help them to understand the need to change. Listen and respond to their needs, fears, desires, and concerns. Help people see what is in it for them and allow them time to warm up to the changes. Major change usually is impossible unless most employees are willing to help, often to the point of making short-term sacrifices of their time and energy. Employees' hearts and minds will fail to be captured without credible communication. There are several key elements to effective communication of the vision. Some experts suggest that 20 percent of the organization tends to buy in to the need to change and will commit from the beginning, another 50 percent may not care either way and so do not commit, and another 30 percent will take a hard stance and oppose change. For this reason, it is important to help all employees understand the vision. The message should be clear, simple, and easily understood. Trying to impress people with a message full of overly complicated terms only creates confusion, suspicion, and alienation. The leader should take time to develop a clear, concise, and direct description of the vision. Using metaphors, analogies, and specific examples can help people develop a mental picture of the vision. Well-chosen words can express a memorable message. If they have a clear and attractive picture of the future, people can transform thought into reality and intentions into action. Different people learn and retain information in different ways. Some people are more visual and learn from seeing how it is done; some are more kinesthetic and learn from actually doing; others are more auditory and learn from listening. The leader should present the message in multiple forums and formats. Present the message in both large and small forums. Use memos, newsletters, and posters. Discuss the vision in formal and informal interactions. When the message arrives in multiple formats, people have a better chance of remembering and comprehending the vision. Ideas sink in deeply only after they have been heard many times. Repetition of the message is important because many people do not fully grasp a concept after one exposure. A sentence here and there, a short paragraph, a brief mention of the vision at various meetings will collectively add up to a massive amount of communication. A powerful means of communicating the vision is by setting an example. The term “walk the talk” may be overused, but in reality, change leaders must live by this principle. When the organization sees top management acting out or actively involved in the implementation of the vision, the question of credibility or sincerity will disappear. Words are cheap, but action is not. Even the most cynical individuals will tend to be impressed by action. When communicating the vision, the leader should be willing to listen and accept feedback. Discussions help answer questions and clarify uncertainties. Many people can accept new ideas only after they have had time to process the concept. Allowing time for processing, questioning, challenging, and discussing will provide for a better understanding of the vision and will enhance individual buy-in. It is critical that the organization have trust in the leader. Covey stresses that trust from others must first start with self-trust. Covey’s first three habits focus on developing personal integrity. To have trust from others, the leader must live a life of integrity. Self-trust is necessary to think and act interdependently. Dr. W. Edward Deming also supported the concept that the first step in transformation is transformation of the individual. Deming states that the individual, once transformed, will perceive new meaning in life, in numbers, and in interactions between people. Before groups of people can grow and deal with change, the individuals in the group must develop a sense of personal integrity and move along a path toward self-actualization. Only then can they feel comfortable with change and envision it as an exciting opportunity, as opposed to fearing it as a deviation from their comfort level. To guide the individual transformation process, the organization must trust that the leader has their best interest as a priority. This process requires active communication and interaction on the part of the change leader. Lasting change takes time. Strong believers in the process may stay the course; however, most people will not go on the long march unless they see some compelling evidence within 6 to 18 months that the journey is providing results. Nonbelievers will have even higher expectations of results. Without short-term wins, too many employees will lose interest. Processes that measure incremental change over several years will take four to five years to start indicating any sort of a trend. However, the data that are being collected may involve thousands of contact points for those who provide them. For example, the change from a reactive breakdown-maintenance-oriented culture to a proactive preventative-maintenance-oriented culture may take several years to show improvements. For the employees doing the preventative maintenance work, five years is more than 1,000 working days. Without shorter term performance indicators, the changes may be so slow that the employees performing the work will not be able to notice those changes. These individuals require feedback on a shorter cycle and need to find short-term wins to encourage the desired performance. Short-term wins show people that their efforts are paying off and that they are improving, and they encourage continued support. Short-term wins provide an opportunity to celebrate. Constant tension is not healthy in the long run, so a celebration offers an opportunity to relax and recover. This is good for both the body and the soul. Short-term wins provide concrete data that can be reviewed to refine the process, if needed. The strategy at the onset may not be entirely correct and may need to be adjusted. Without evaluating short-term wins, problems with the strategy will become apparent too late in the process and will delay efficient progress. Short-term wins help the organization position itself to succeed in the long term. Short-term wins also build momentum, gain support from or for leadership, and win over those who were neutral. Everyone, including those in the hierarchy, likes to see that the transformation is on track and making an impact. Those who were neutral or even opposed to change often want to become involved with a successful program. This is especially true if the short-term success confirms that the change is inevitable. A year or two into a major change program, and with no immediate end in sight, people naturally get tired and tend to take a break. They often need renewed motivation, and short-term wins can be used to rearticulate the vision and reinforce the sense of urgency. Short-term wins are essential to keep momentum moving forward, but the celebration of those wins can be lethal if a sense of urgency is not reinforced. Because major change is so difficult to accomplish, a powerful force is required to sustain the process. Even the strongest leader needs assistance to develop a shared vision, communicate to a large number of people, eliminate all of the key obstacles, generate short-term wins, guide multiple change projects, and anchor cultural change. There is an inherent conflict of interest in some organizations with regard to using teams. One common factor is that teams are not promoted; individuals are. Individuals need to demonstrate their personal capabilities to advance. Teams often are not rewarded for performance; individuals are. Additionally, many senior-level executives were groomed in an environment in which teams were not essential. They may have experienced poorly functioning committees where everything moved slower instead of faster, so they are more comfortable with the hierarchical format. Leaders need to develop an organization where individuals are rewarded for their team performance, managers are encouraged to promote team decisions, and teams receive training on effective decision making. Throughout the change process, the leader must instill a sense of trust. Teamwork generally is effective only when trust is present. Teams with the right composition, sufficient support, and trust among members can be highly effective in implementing organizational change. The organization must trust that the leader has the organization’s best interest as a top priority. Teammates must learn to trust one another as well. Employees often develop a sense of loyalty to their specific work unit and mistrust of the motives of others, even if they are in the same organization. Individuals or entire work units may feel that others are not doing their fair share. Stronger performers should be rewarded for assisting weaker performers and be told how their specific contribution benefits the group as a whole. Leaders must be able to help individuals and work units transcend these short-term constraints and develop an organizational culture that encourages a sense of trust toward the organization’s leaders and between work units. Developing a strong common goal allows teams to have a central focus. The organization’s mission, vision, guiding principles, and strategic plan help to create a shared objective. A true desire to make the organization perform to the highest level possible—true commitment to excellence—can be the common goal that every employee and team can rally around. When a sense of trust is created, developing a shared common goal becomes significantly easier. A sense of trust and a common shared goal make for a powerful combination. The resulting coalition will have the capacity to make lasting change and overcome the inertia that resists change. The challenge of organizational change lies not in the mechanics of making change, but in addressing the cultural norms that define the current organization. Often the biggest resistance or roadblock to change is the organization’s workforce culture itself. Organizational culture is a strong influence and often difficult to change. This culture tends to set the rules and boundaries of our organizations, whether consciously designed or not. Think of the last time you heard someone say, “That’s not the way things are done around here.” This is an example of the pervasiveness of organizational culture. Organizational culture is reinforced almost without thought by the members of the organization and often is described as a subtle pressure to belong by conforming. A series of experiments performed several years ago demonstrated this concept. Five monkeys were placed together in a cage with a series of steps in the center. A cluster of bananas hung from the ceiling above the steps. Naturally, the monkeys would climb the steps to reach the bananas; unnaturally, the researchers conducting the experiments would spray the other four monkeys with a high-powered water hose whenever one monkey attempted to climb the steps. Gradually, the monkeys learned not to pursue the bananas. Then, the researchers began pulling one monkey out of the group and replaced it with another. The new monkey would immediately head for the bananas, and the other four, knowing what would happen, would pull the monkey down to the ground. The new monkey quickly learned not to pursue the bananas. The researchers continued to replace monkeys one at a time with similar results. Eventually, a group of monkeys that had never seen a water hose would pull a new member down from the steps. None of the new monkeys actually knew why they were supposed to avoid pursuing the bananas, but a culture had developed. Changing this culture will take a whole new approach. This does not imply that we are all just monkeys or helpless victims of the organizations to which we belong. However, an organization’s culture is complex and influential. A dedicated change agent needs to recognize that to make effective change, the organization’s culture may require adjustment. It takes time to develop a new culture that is willing to embrace a new way of doing things. This is not an easy concept because the elements that create the organization’s culture are not sharply defined. Changing an organization’s culture takes patience and persistence because its values reach deeply and integrate into a network of beliefs that tend to maintain the status quo. If the leader does not continue to push forward, the entropy of the organization’s previous culture will naturally slide back to the path of least resistance. One of the first reactions to change is likely to be “What is in it for me?” or “How will this affect me?” Another reaction to change may be “Getting better implies that we are bad.” This generally is not the case, and to go from good to great, an organization has to get “better.” Transitioning to the unknown, however, creates a natural resistance and triggers our innate fight-or-flight response. There is often a natural discomfort with uncertainty. Resistance to change can come in the form of how people feel about the change, how they think about the change, or how they act in the face of change. Therefore, it is critical that the change leader understand the signs and cause of resistance to effectively guide the organization through the change process. People resist change for a number of different reasons. Some people like stability and dislike changes. Some are uncomfortable with ambiguity and uncertainty. Some are concerned about the impact of change on their personal interests, such as pay, status, or tenure. Readiness for change can be affected by people’s attachment to the existing culture or their image of the existing culture, beliefs, and values. Some people have a perception of an implied psychological or social contract and that change is a violation of that contract. Some may feel that change is simply not necessary, that the proposed change is inappropriate, or that the timing is wrong. Additionally, a cumulative effect of previous change affects people’s perceptions. If they experienced change that was poorly implemented, they will be leery of additional change efforts. Change is not the same as transition. Change is situational: the new work site, the new policy, the new process, or the new vision. Transition is the psychological process people go through to come to terms with a new situation. Change is external, while transition is internal. Unless transition occurs, permanent change will not take place. Psychological transition requires letting go of the old reality and the old identities. Nothing undermines an organizational change process more than failing to take the time to allow transition to take place. For example, when a front-line employee first advances to a supervisory position, their role has “changed.” This individual will not be fully successful until he or she allows his or her mindset to transition from getting work done as an individual contributor to getting work done though others. Various models of transition describe a three-step process. This process is based on the cycle of denial and resistance, exploration, and commitment. Denial involves a refusal to recognize the situation is changing and resistance begins with the recognition that the situation is not going away. Individuals in this stage must learn to let go of the old ways. Exploration involves the first step of acceptance and the willingness to explore the possibilities of a new situation. This second step is the limbo or neutral zone between the old reality and the uncomfortable feeling caused by uncertainty of what is ahead. It is not always the change that people resist; rather, they fear the loss of the old and uncertainty of the future. During this step, there is the temptation to abandon the situation and revert back to the old reality. Therefore, leaders must take the time to guide this step of the process. The final step involves acknowledging and accepting change and a commitment where focus is given to the new course of action. With an understanding of the signs and cause of change resistance, the change agent can effectively guide organizational and individual change through this three-step transition process. The first step of the transition process involves departing from the existing state. This step requires overcoming the organization’s cultural inertia and dismantling the existing "mindset." Normal defense mechanisms have to be bypassed. During this step, it is important to set a sense of urgency and to stress the need to leave the old behind. To guide the transition process through this stage, it is important to acknowledge what is being lost, communicate what is being left behind, discuss how any loses will be compensated, and describe what is going to be retained in as much detail as possible. More important, the leader, while honoring the past, must successfully express the vision for the future that will inspire people into action. Providing clarity of the vision, path, and anticipated outcome will help to reduce the perception of uncertainty. For example, consider a facilities organization that wishes to change from a zone maintenance concept to a central shop maintenance concept, or vice versa. The change leader must acknowledge that there will be perceived losses by those individuals within the zones and even the customers of the zone shop services. It is critical to describe how the new central shops will function and how it will affect the individuals involved. Taking time to fully describe the new roles and responsibilities will ease the transition process. It is not always possible to envision every impact of a change, but it is important to foresee as many impacts as possible. Imagine that the change is a cue ball rolling across the surface of a pool table. There are lots of other balls on the table. Some of the balls that are impacted were planned, while some were unintentional. In billiards, it is important to foresee as many hits as possible, and the same applies when promoting change. The change process has started a cause-and-effect chain reaction, and for each of these try to envision the people who will be impacted and what impact that change will have on their familiar ways of doing things, their familiar roles, their familiar expectations, and even their familiar values. The leader must realize that everyone reacts to change differently. Compassionate communication will help reassure that the change process is for the benefit of everyone. The change leader must take time to listen openly, honestly, and sympathetically. Loss is a subjective experience, so the leader must take the time to acknowledge their feelings, even if they appear objectively unfounded. Failure to do so will give them the feeling that the leader does not care, will lower trust levels, and make the transition process more difficult. It is critical that the change leader not overreact to the initial resistance. People impacted by change will experience a sense of loss, and grieving this loss is normal. Failure to guide people through this grieving process will create an emotional deficit that impairs the transition process. Therefore, change leaders must expect and accept the signs of grieving such as anger, denial, anxiety, sadness, disorientation, and depression. The next step in the transition process involves the journey into unknown territory. The change leader must effectively guide individuals through this neutral zone. During this step, there is often some sense of confusion. The difficulty of this step is that the organization enters a state of affairs where neither the old ways nor the new ways work satisfactorily. People feel caught between the demands of conflicting systems. People are aware that the old ways are being challenged, but do not have a clear picture to replace them with yet. If the change is minor, simply waiting for the neutral zone to pass may be an option. However, if the change is deep and far-reaching, this step of the transition may take many months or even years. It is not uncommon for change leaders to abandon a program at this stage due to impatience or frustration. Abandoning the program at this stage is actually more detrimental than not embarking on the change process in the first place. During this step of the transition, people will experience anxiety and motivation may fall. People will feel disoriented and may experience lower levels of energy. Old weaknesses may resurface; for instance, if customer service has always been a little weak, it is certain to take a further dip while the organization transitions through the neutral zone. During the neutral zone, employees may feel overloaded as they try to manage the old processes and implement the new ones. It is for these reasons that the change leader must effectively manage the neutral zone. Managing the neutral zone is not something that would be nice if there were plenty of time. It is the only way to ensure the organization comes through the change intact and the necessary changes actually work. Neutral zone management actually saves time in the long run because it means the change leader does not have to implement the change a second time, people are not permanently discouraged from implementing additional change processes, and the organization will not totally fall apart during the transition between the old ways and the new. The transition period during the neutral zone is not a step function that happens in one easy step. It is a journey, and takes time. It is a time when necessary reorientation and redefinition takes place. There are a variety of actions a change leader can use to guide the organization through this neutral zone. Leaders must provide everyone with an important role to play. People need to have a clear understanding of what is expected of them and need to feel that they are contributing. During the transition process, roles and expectations may change so the change leader must take time to redefine these new roles. In turn, it is important to define how these new roles contribute to the overall vision. These new roles may also require training or resource reallocations. Leaders can create a theme for the transition period that suggests a journey from the old to the new. People are not just literal-minded; they also react symbolically to events. Creating a theme for the change process can be an effective method for rallying the troops towards a common goal. Leaders can utilize short-term wins to build momentum, gain the support from or for leadership, and win over neutral supporters. Leaders should provide consistent and effective communication. This communication must keep people informed and advertise the positive impacts of the changes taking place. Effective communication also includes taking the time to listen to input from those being affected. Leaders should implement effective support systems, provide constant encouragement, look for opportunities for additional improvement, and encourage ingenuity. An effective suggestion campaign can help the change leader address the uncertainties that arise. Input may also offer suggestions on how to improve the original concept. Nothing can undermine the transition process more than the appearance that good suggestions are being ignored or not taken seriously. As noted earlier, not every impact can be anticipated, so empowering people to solve the unknowns that may arise will gain their support and help them to feel a part of the solution. Leaders must establish and reinforce a perception of trust. People are more willing to undertake change if they trust their manager. There are actions the leader can do to reinforce their trustworthiness. Leaders must do what they say they will do. Leaders must listen to people carefully and understand what matters most to them. Leaders must act with honesty and integrity, and extend their trust to others. An effective leader can increase their level of trust by being decisive and creating a constancy of purpose. Trust often has to be earned, so the leader must get started immediately. By following these concepts and using time in the neutral zone to create a sense of belonging and purpose, a change leader can effectively guide the organization through the most difficult stage of the transition process. The final step is acceptance or attaining a new equilibrium. The new mind set is crystallizing and comfort levels return to previous levels. At this point, a new culture begins to develop. People begin to see their new role in the change process. The combination of trust and a common shared goal will create the environment that enables individuals to reach this step quickly. As the change becomes more accepted, it is critical that the organization celebrates successes every step of the way. The leader must then use these successes to reinforce a culture of change. The leader must publicize the successes and justify any necessary adjustments. To sustain acceptance, it is imperative that praise be given when recognition is deserved and input from employees be used to make adjustments. To promote a culture of continuous improvement, the leader will need to continuously guide the organization through this three-step process. It is not uncommon for organizations to quickly become comfortable with the new equilibrium. Continuous improvement requires a continuous circular path through this three-step process. During the change process, the change leader must focus on demonstrating empathy, patience, flexibility, and openness, but remain decisive and committed to the strategic change initiative. Since relationships that are established during the change process can be considered the foundation for long-term sustainable change, the manner in which resistance to change is addressed is very important. Understanding the three stages of transition will enable the change agent to not only reduce resistance but also integrate people in the change process in a positive manner. By following the above advice, a change agent can help reduce the stress and anxiety of change for both themselves and the organization. Deming theorized that quality leadership must focus on improving how work gets done (the method or process) instead of simply focusing on what gets done (the results). Deming also theorized that the principles of quality leadership must include customer focus, obsession with quality, recognizing the structure in work processes, teamwork and unity in purpose, and continued training and education. Management by results often focuses on profit and losses or return on investment. Quality leadership starts with the customer. The organization's goal should be to meet and exceed customer needs. Quality organizations recognize both internal and external customers. Obsession with quality must become part of an organization’s culture. Quality must be pursued through the services that delight customers, and efficient and effective processes. Work is not haphazard and always has some form or structure. The structure may not be readily evident and often can be hidden behind inefficiencies. For this reason, processes must be studied, measured, analyzed, and improved. Great people with a poor process may be able to provide good service, but great people using a great process can provide great service. Process measurements guide process improvement and are recognized as a means rather than an end. Quality organizations encourage teamwork and partnerships to foster a sense of unity in purpose. Providing quality service should be the goal of everyone in the organization. A clear and widely understood vision is necessary to create the sense of community and to reinforce the sense that we do excellent work. The notion of a common goal of quality also applies to the relationships with suppliers, regulatory agencies, and local communities. In a quality organization, everyone is constantly learning. Management should encourage employees to constantly elevate their level of technical skill and professional expertise. Employees should be encouraged to master their jobs and broaden their capabilities. One approach to translating these theories into practice has been referred to as the Joiner Triangle. One corner of the triangle refers to quality as defined by the customer. A second corner represents the scientific or data-based approach to studying processes. The third corner represents employees working together as a united team to learn and apply these principles. These three elements must function together to ensure success. In process improvement, the concept of the customer and supplier takes on a slightly different aspect. In this process, people or organizations that precede the process being studied are the “suppliers,” and those who follow are the “customers.” The various campus stakeholders are indeed customers, and it is important to satisfy and even delight these people. Inside the organization, however, employees who pass on work to other employees are considered suppliers, with internal customers. Similarly, external suppliers who supply materials, information, or services are a critical part of the entire process. Therefore, each worker in an organization has suppliers and customers. Once the concept of processes, including the concept of customer and supplier relationships, is understood, people will be in a better position to appreciate what quality means. If customers are those who are the recipients of services or products, then only the customers can determine what quality means to them. That is the basis of the phrase “quality begins with the customer.” Therefore, quality must be a part of the entire process, not just a part of the final product or service. Quality must be built into every step, process, and system to ensure a quality product or service. “Customers” and “suppliers” must be considered and collaborated with during every step. It is critical to remember that the responsibility for quality ultimately lies with top management. Only they can establish the organization's commitment to quality. They must make certain that the organization asks the questions: Are we doing the right things? And are we doing things right? Only top management has the ability and influence to provide employees with the support needed to deliver quality products and services to the ultimate stakeholders. While the customer-supplier relationship is viewed from a different perspective in the process improvement environment, it is still critical to understand the ultimate reason for improving the facilities management service delivery to provide quality service to the various campus stakeholders. This requires the organization to develop a customer-driven focus. It requires listening to your customers, as well as identifying and anticipating their needs and concerns. Organizations should strive to go beyond customer satisfaction to customer delight. Competition from outsourcing is a constant threat to any university facilities organization. To remain competitive, the facilities organization must look for opportunities to improve service delivery. There is no room for mediocrity, and those who refuse to change with changing demands will soon disappear. The most important entities on the premises. Not dependent on the facilities organization. The facilities organization is dependent on them. Not interruptions to the facilities work, but the purpose of it. Not an outsider to the business, but a part of it. Doing the facilities organization a favor by giving them an opportunity to serve. Therefore, it is critical to include the various facilities customers in any facilities change process. Customer focus is a key component of effective facilities management. Various stakeholders (faculty, students, staff, and other administrative departments) must feel that their needs are heard, understood, and acted upon. Tools must be in place to ensure customer communication, assess and assimilate what is said, and implement procedures to act on expressed needs. People who view work as a series of processes understand how the quality of what comes out is largely determined by the quality of what goes in. Whole new insights develop when people see tasks as a related series of events. If people see how their role contributes to the entire process, then they have a better understanding of how their role contributes to the final product. Better processes lead to better quality, and often to better service delivery. With a common understanding, workers can define starting and ending points to a process, and figure out what has to happen in between to provide the desired service level. For example, consider the work request from the customer: If the desired goal is to provide regular and meaningful status reports, then those providing the front-line service delivery must understand their role. If the completed work orders do not include descriptions of the services provided, then the service center cannot adequately inform the customer. Or, if service delivery is delayed because of the unavailability of parts , then the service desk cannot notify the customer of a delay. Therefore, the front-line service delivery staff must understand that their role includes more than just performing the work; they are a critical link in the customer communication process. A series of tasks is called a process. A series of processes is referred to as a system. Sometimes if a project improvement team feels overwhelmed, they may be studying a system and not a process. Unless the team narrows its focus, it stands a good chance of getting mired down and will not make adequate progress. Teams should focus on one process at a time, unless two or three processes are closely related and would be difficult to study separately. Information and analysis are essential to evaluate performance and drive future performance improvements. The scientific approach studies the quality improvement methods and helps answer the question: How well are we doing? Although it may sound complicated, the scientific method is simply a systematic approach to study processes. Although it can involve complicated formulas, data, and statistics, it is more often a simple means for teams to study the root cause of problems rather than relying on hunches or perceptions of superficial symptoms. Dr. Joseph M. Juran conjectured that the concept that "organizations would have fewer problems if only employees would do their jobs properly" is incorrect. In fact, the potential to promote quality improvements lies more with improving the processes, not improving the workers. This concept has evolved into the 85/15 Rule: at least 85 percent of the problems can be corrected by improving the process (which is determined largely by management), and only 15 percent are under the employee's control. In fact, if it appears that the problem does lie with the employee, the trouble often lies with poor instructions or inadequate training, which are both also system problems. Once leaders understand that systems and processes create the majority of the problems, they will stop blaming individual workers. They will start focusing on improving systems, will start asking which processes are inefficient, and more likely will seek out solutions that will have long-term benefits. The scientific method was first described by Francis Bacon around 1620. The scientific method can be described as hypothesis, experiment, and evaluation. Shewhart described manufacturing under statistical control as a three-step process of specification, production, and inspection. He specifically related this to the scientific method of hypothesis, experiment, and evaluation. Shewhart says that the statistician must improve the quality of goods by showing how to tighten the tolerance range. Deming later described this process as Plan, Do, Check, Act (PDCA). It is also known as the Deming Cycle, Shewhart Cycle, Deming Wheel, or Plan-Do-Study-Act. A fundamental principle of the scientific method and PDCA is iteration: once a process is defined, measured, and analyzed, executing the cycle again will extend the knowledge further. Repeating the PDCA cycle can bring the process closer to the ultimate goal, usually a perfect operation or improved quality. One can envision an open coil spring, with each loop being one cycle of the PDCA cycle and each complete cycle indicating an increase in our knowledge of the system under study. PDCA provides feedback in spirals of increasing knowledge of the process to incrementally improve the next cycle. PDCA is an iterative four-step problem-solving process typically used in quality control (see figure 1). PLAN. Establish the processes necessary to deliver results in accordance with the objectives or specifications. CHECK. Monitor and evaluate the processes and results against objectives and specifications and report the outcome. The following is a brief description of some of the more common tools used to analyze and enhance organizational performance. Flowcharts are simple tools that model each step in a process. Once the team can visually see the sequence of actions, it will have a common reference point for further analysis. There are a variety of formats for flowcharts. A detailed in-line flowchart is one option, but can be time-consuming to create and generally is the least effective option (see figure 2). As the name implies, this type of flowchart contains a lot of information and describes in detail what happens at every step in the process. This type of chart would include everything, such as loops caused by rework or other steps that evolved over time to eliminate quality problems. Use detailed flowcharts sparingly. The detail they provide often includes unnecessary steps, and it can take weeks to develop one that everyone agrees on. By this time, the team may already be discouraged, and it has not even started on the more challenging step of analysis. A top-down flowchart is a picture of the major steps involved in a process (see figure 3). To construct a top-down flowchart, first list the most basic steps across the top of a page or flip chart. This step should have no more than six or seven primary process steps. Then below each primary step list the major substeps (again, no more than six or seven). By limiting the amount of information on any single chart, the team is forced to narrow its focus to only those steps absolutely necessary for the completion of the process. Over time, invariably steps or complexities are added to a process to prevent rework or fix problems. The advantage of a top-down flowchart is that it eliminates the need to include tasks that are not essential for completion of the process, such as inspections, steps to prevent rework, or other steps that evolved over time to eliminate quality problems. Top-down flowcharts allow teams to focus on only the steps that need to happen, not what is actually happening. Once the team can see the major steps, it can take the time to ask questions, such as "Where do we go off track?" or "What causes us to go off track?" The answer to these questions points the team toward potential solutions, not just the problem itself. This process is typically faster and more efficient than developing detailed flowcharts that describe every step along the way. Deployment charts combine the two ideas: what happens in a process and who is responsible for each step in the process (see figure 4). This method is useful for teams to track what each person or work unit is supposed to do, where they fit into the sequence of the process, and how they relate to the other players at each stage. To construct a deployment chart, list the major steps of a process vertically on a page or flip chart. List each of the players (individuals or work units) across the top, and draw lines to create columns under each heading. Then mark the key action at each step in the appropriate box, denoting which players are involved in which steps. This format allows the team to visually see the major steps and the major players simultaneously. A work flow diagram is a picture of the movement of people, materials, documents, or information in a process (see figure 5). It is developed by tracing the movements on a sketch of the floor plan or similar map of the work space. The power of these sketches lies in illustrating a system's inefficiency in a clear picture. Places where work can be simplified often practically jump off the page. The interest lies in whether excessive or unnecessary movements can be eliminated by a more ideal layout, arrangement, flow path, or change in a process. Pareto charts contain a series of bars whose heights reflect the frequency or impact of process problems (see figure 6). The bars are then rearranged in descending order in height from left to right. This format allows the team to identify the problems that have the most impact. The name of this chart derives from the Pareto Principle that 80 percent of the troubles are caused by 20 percent of the problems. This concept was first developed by the economist Vilfredo Pareto, later applied to the idea of management by Juran. Juran advises us to concentrate on the "vital few" sources of problems and not be distracted by those of lesser importance. Of course, in continuous improvement efforts, once a large problem is resolved, then lesser problems now show up as the next major cause of additional problems. The team can use tools such as brainstorming to identify the problems in a process or solutions to a problem, and use Pareto voting (also referred to as multi-voting) to rank them. The cause-and-effect diagram, also referred to as a fishbone diagram because of its appearance, allows teams to map out a list of factors thought to affect a problem or desired outcome (see figure 7). This type of diagram was invented by Kaoru Ishikawa and is also referred to as an Ishikawa diagram. The concept behind the cause-and-effect diagram is to identify and organize possible causes of problems and factors needed to ensure the success of a particular effort or process. The problem, situation, or event is listed on the right of the chart. A central arrow is drawn to the left of the problem. Branches off the central arrow indicate main categories of factors that affect the problem. Each primary branch can include sub-branches that affect that particular primary branch. The advantage of this format is that it allows the team to visually see the relationship between the various factors that affect the process. Common factors that affect the process or solution typically include equipment, personnel, methods, materials, and environment. Because this format typically generates significant and detailed discussions, cause-and-effect diagrams are best used after the process has been described and the problem well defined. By this time, team members have a good idea of which factors to include on the diagram. It is important to remember that a cause-and-effect diagram will identify only possible causes to the problem. Only data can identify the actual causes. Many factors that affect a process may change over time: Ingredients decay, new people are hired, tools and equipment wear down, and suppliers may change. Any of these changes can affect the data that are being collected to analyze a problem. Detecting these time-related shifts, trends, or patterns is an essential step in making long-lasting improvements. Time charts are a useful tool to track these process variables (see figure 8). A control chart is a time chart that has an added feature; it includes the range of variation built into the system (see figure 9). This type of chart often includes upper and lower statistical control limits, which are calculated according to statistical formulas from data collected on the process. This type of chart allows the team to monitor a process to see whether it is in statistical control. Points that fall outside of the upper or lower control limits or fall into particular patterns indicate the presence of a special cause of variation, and they deserve investigation. The control chart gives the team information on variations that may come and go unpredictably. Data points that stay within the upper and lower control limits indicate that the process is performing as intended or that any slight variances are coming from common causes. It is important to note that control limits do not indicate what a process is supposed to do or what managers hope to achieve; they merely describe what the process is capable of doing. The only way to make improvements is to fundamentally change the process; however, the control chart will help monitor the impact or effectiveness of those changes. Once the team has identified and modified the root causes of the variations, the distance between the upper and lower control limits will narrow. Dot plots are simple graphs that show the frequency of various values or events (see figure 10). A dot is added to the plot above a particular factor or event each time that factor or event occurs. Dot plots are easily constructed and readily convey information. A quick look at the chart tells the team the range of measurements, the central values (mean, median, average), and how the data are distributed. These types of plots typically are used to get a quick look at the data before conducting further analysis. Sometimes the data will appear in the shape of a bell formed by the natural tendency of the data to cluster around a central value, such as the average or mean, and taper off on either end. Other times, the data may show abnormal patterns, such as those caused by errors or process variations. Scatter diagrams differ from dot plots in that they show the relationship between two variables or characteristics (see figure 11). In fact, the most powerful aspect of a scatter diagram is its ability to visually show the relationship between variables. The control parameter or independent variable is customarily plotted along the horizontal axis. The measured or dependent variable is customarily plotted along the vertical axis. A scatter diagram can suggest various kinds of correlations between variables with a certain confidence level. Correlations may be positive (rising), negative (falling), or null (uncorrelated). If the pattern of dots slopes from lower left to upper right, it suggests a positive correlation between the variables being studied. If the pattern of dots slopes from upper left to lower right, it suggests a negative correlation. A line of best fit, or trend line, can be drawn to study the correlation between the variables. An equation for the correlation between the variables can be determined by established best-fit procedures. For a linear correlation, the best-fit procedure is known as a linear regression. Rate of change or the rate of improvement is a key competitive factor in today's world. PDCA allows for major jumps in performance or transformational breakthroughs, as well as frequent small or incremental improvements. The PDCA cycle or improvement activities can be implemented in several methods. Some of the most popular include Lean, Six Sigma, Kaizen, and Business Process Improvement. Lean production, which is often known simply as "Lean," is the optimal way of producing goods or services through the removal of waste and implementing flow and value stream mapping. The theory is based on the concept that removing wasteful activities or non-value-added activities will improve productivity and improve the organization's ability to provide quality products or services. The focus of Lean is to increase speed and information feedback. Two key components in the Lean process include the “pull” system and Value Stream Mapping. The “pull” system is an important concept in Lean production and involves looking at the throughput or yield. Traditional manufacturing used the “push” concept, making large batches of product and “pushing” them to each downstream operation whether or not they are ready for them. The pull concept involves controlling cycle time, process time, lead time, touch time, and the rate of pace at which the customer expects to receive goods, products, or services. This leads to the concept of just-in-time delivery. The Lean process can lead to reduced inventory, quicker delivery and lower costs related to delivering the final product or service. Identify the target product, product family, or service. Draw a current state value stream map, which includes the current steps, delays, and information flows required to deliver the target product or service. This may be a production flow (raw materials to consumer) or a design flow (concept to launch). Standard symbols typically are used to represent supply chain entities. Assess the current state value stream map in terms of creating flow by eliminating waste. Draw a future state value stream map. "Six Sigma" is a registered service mark and trademark of Motorola, Inc. It is a business management tool that seeks to identify and remove the causes of defects and errors in system processes. It uses a set of quality management methods, including statistical methods, and creates a special infrastructure of people within the organization who are experts in these methods. Each Six Sigma project follows a defined sequence of steps and has quantified targets. Six Sigma was originally developed as a set of practices designed to improve manufacturing processes and eliminate defects, but its application was subsequently extended to other types of business processes as well. In Six Sigma, a defect is defined as anything that could lead to customer dissatisfaction. Six Sigma was heavily inspired by six preceding decades of quality improvement methodologies, such as quality control, Total Quality Management (TQM), and Zero Defects, based on the work of pioneers such as Shewhart, Deming, Juran, Ishikawa, Taguchi, and others. The term "Six Sigma process" comes from the notion that if one has six standard deviations between the mean of a process and the nearest specification limit, practically no items will fail to meet the specifications. Processes that operate with "Six Sigma quality" over the short term are assumed to produce long-term defect levels below 3.4 defects per million opportunities (DPMO). Six Sigma's implicit goal is to improve all processes to that level of quality or better (see figure 12). Continuous efforts to achieve stable and predictable process results (i.e., reduce process variation) are of vital importance to business success. Business processes have characteristics that can be measured, analyzed, improved, and controlled. A clear commitment to making decisions should be made on the basis of verifiable data, rather than assumptions and guesswork. A feature that sets Six Sigma apart from previous quality improvement initiatives is a special infrastructure of experts to lead and implement the Six Sigma approach. Six Sigma borrows martial arts ranking terminology to define a hierarchy that includes several key roles for its successful implementation. Executive Leadership includes the chief executive officer and other members of top management. They are responsible for setting up a vision for Six Sigma implementation. These leaders also empower the other role holders, or players, with the freedom and resources to explore new ideas for breakthrough improvements. Champions are responsible for Six Sigma implementation across the organization in an integrated manner. The Executive Leadership typically selects them from upper management levels. Champions also act as mentors to Black Belts. Master Black Belts, identified by the Champions, act as in-house coaches. They devote 100 percent of their time to Six Sigma. They assist Champions and guide Black Belts and Green Belts. Apart from statistical tasks, their time is spent on ensuring consistent application of Six Sigma across various functions and departments. Black Belts operate under Master Black Belts to apply Six Sigma methodology to specific projects. They primarily focus on project execution, whereas Champions and Master Black Belts focus on identifying projects. Green Belts are the employees who take up Six Sigma implementation along with their other job responsibilities. They operate under the guidance of Black Belts. Six Sigma has two key methodologies: DMAIC and DMADV, which were both inspired by Deming's PDCA Cycle. DMAIC is used to improve an existing business process, whereas DMADV is used to create new product or process designs. Define process improvement goals that are consistent with customer demands and the organization's strategy. Improve or optimize the process based on data analysis. Control to ensure that any deviations from target are corrected before they result in defects and continuously monitor the process. With strategic goals in mind, an executive team identifies areas or processes on which to focus that are consistent with customer demands and the organization’s strategy. Based on that analysis, an improvement project is then initiated. Through a rigorous methodology, a project team determines customer needs (DEFINE) and gathers information on the current (as-is) process performance (MEASURE). This examination reveals issues and problems in the existing process. In ANALYZE, root causes of the issues or problems are identified and confirmed with data. Once the causes have been established, solutions are developed and implemented (IMPROVE), followed by actions to ensure that the improved process is standardized and resulting gains are maintained (CONTROL) (see figure 13). Define design or process goals that are consistent with customer demands and the organization's strategy. Measure and identify characteristics that are critical to quality and process capabilities. Analyze to develop and design or process alternatives to select the best alternative. Design details, optimize the design or process, and plan for design or process verification. Verify the design or process, set up pilot runs, and ultimately implement the process. In DEFINE, the purpose and scope of the project are established. In MEASURE, customer data are translated into critical-to-quality characteristics (i.e., design measurements) that the design must meet. Next, the project team generates and evaluates innovative concepts to determine the one that will best meet the design requirements (ANALYZE). High-level designs are then developed and tested (DESIGN). At this point, the design that has tested best is verified against the design requirements and validated against the intended use (VERIFY). Finally, the new design is transitioned to the process owners for rollout, implementation, and control, completing the DMADV methodology (see figure 14). The difficulty of Six Sigma is that it was designed for manufacturing processes. The biggest variance in the service delivery arena is related to the nonstandard behaviors of people. The concepts can be effectively applied to facilities management, however, because every service is process driven. Leaders should guide the process to help resisters to change and should adopt new methodologies that remove non-value-added work. To provide Six Sigma service, an organization must be proficient at managing existing processes, committed to process improvement, and willing to adopt new processes. Kaizen (Japanese for "improvement") is a Japanese philosophy that focuses on continuous improvement throughout all aspects of life. When applied to the workplace, kaizen activities continually improve all functions of a business, from maintenance to management and from the chief executive officer to the front-line workers. By improving standardized activities and processes, kaizen aims to eliminate waste. Kaizen was first implemented in several Japanese businesses, including Toyota, during the country's recovery after World War II, and has since spread to businesses throughout the world. Kaizen is a daily activity, the purpose of which goes beyond simple productivity improvement. It is a process that, when done correctly, humanizes the workplace, eliminates overly hard work, and teaches people how to perform experiments on their work using the scientific method. With this philosophy, people learn to spot and eliminate waste in business processes. Consider the process, and the results, so that actions to achieve effects are discovered. Think systemically about the whole process to avoid creating problems elsewhere in the process. Take a learning, nonjudgmental, nonblaming approach to the reexamination of the assumptions that resulted in the current process. Although kaizen usually delivers small continuous improvements, the culture of continual aligned incremental improvements and standardization yields large results in the form of compound productivity or process improvement. Hence, the English usage of kaizen can be "continuous improvement." Business Process Improvement (BPI) is a systematic approach to help an organization optimize its underlying processes to achieve more efficient results. Most BPI techniques were developed and refined for manufacturing, although many of the core principles and methodologies can be successfully adapted to work in the service-based environment. Defining the organization's strategic goals and purposes: Who are we, what do we do, and why do we do it? Determining the organization's customers (or stakeholders): Who do we serve? Aligning the business processes to realize the organization's goals: How do we do it better? Although BPI has similarities and uses many of the same tools as the other methodologies, the goal of BPI is a radical change in the performance of an organization, rather than a series of incremental changes (compared with TQM or kaizen). Hammer and Champy stated that the process was meant not to impose trivial changes, such as 10 percent improvements or 20 percent cost reductions, but was to be revolutionary. Creating project teams is an important dimension of change management. A single person can make a significant difference in an organization. But rarely does a single person have enough knowledge or experience to understand everything that goes on in a process. Major gains in quality and productivity can be achieved through the use of teams. Pooling the skills, talents, knowledge, and perspectives of various individuals invariably produces better results than individual investment. With proper training, teams often can tackle complex and complicated problems with long-lasting and effective results. Besides the pooling of individual skills, the team also provides mutual support between team members. The synergistic energy created by an effective team can produce results that far exceed the original vision. Therefore, it is important to understand where project teams fit into the overall quality effort and how to use them properly. Active involvement and high visibility of project teams can determine the success or failure of any quality effort. To ensure the team’s success, it is critical to consider certain aspects. The team needs to have a clear and precise mission. Leaders must meet regularly with the team to help the team stay focused, provide necessary resources, or tear down organizational cultural roadblocks. The team members need to understand how to blend teamwork and scientific methods. The team needs to be empowered to think outside of the traditional hierarchical boundaries. The team needs to understand that making improvements is not easy; patience and persistence are a necessity. Team members also need to understand team dynamics. It is important that the leaders and the teams not get discouraged if during the middle of a three- to five-year plan they have not noticed immediate results. Too often an organization loses sight of where it intends to go and makes radical changes in mid-cycle. Patience and persistence are necessary virtues of any effective leader or quality improvement team. The ordinary project team is complicated. Team members must work out personal differences, find strengths on which to build, balance commitments, and learn how to improve. When a team runs smoothly, members can concentrate on the primary goal of improving a process. In contrast, a team that fails to build relationships will waste time on struggles for control and endless discussions that lead nowhere. Knowing what to expect as the team progresses will enable leaders to anticipate and address difficulties. Leaders can help avoid many disruptions and be better prepared for those that cannot be avoided. On the surface, it would seem that managing the team efforts is simply related to improving the process. If, indeed, these were the team’s only concerns, progress would be easy. When people form into groups, however, something seems to get in the way of efficient progress. Team members bring in many personal aspects, including conflicting emotions like excitement and anxiety about being on the team, loyalty to their divisions or departments or previous processes, and nervousness about what they have to offer or their role on the team. If left unattended, these personal aspects can inhibit the team's effectiveness. As the team members gradually learn to cope with the emotional and group pressures they face, the team goes through fairly predictable stages: forming, storming, norming, and performing. More experienced teams and team members will progress though these steps rather quickly. Less experienced teams may take longer to progress through these steps, and the leader must reinforce that these steps are to be expected. During the forming stage, members cautiously explore the boundaries of acceptable group behavior. This is a stage of transition from individual to member status. Because there is so much going on to distract members’ focus in the beginning, little that concerns the specific goal is accomplished. This stage is perfectly normal, and leaders must allow time for the team to form. Storming is probably the most difficult stage for the team. They begin to realize that the task is different, and more difficult than first imagined, so members can become testy, defensive, blameful, or overzealous. Impatient about the lack of progress, but still too underdeveloped as a team to know much about decision making or the scientific method, members can argue about just what actions the team should take. Team members try to rely solely on their personal and professional experience, resisting any need for collaboration. During this stage, team members may have little energy to spend on the task at hand; however, with guidance, they will begin to understand one another. During the norming stage, members begin to reconcile competing loyalties and responsibilities. They begin to accept the team, team ground rules, their roles on the team, the individuality of other team members, and the individual qualifications that each member brings to the team. Emotional conflict is reduced as previous individual competitiveness is replaced with group cooperation. As team members begin to work out their differences, they now have more time and energy to focus on the primary goal. At this point, the team is able to start making significant progress. During the performing stage, the team has resolved its many relationships and expectations. The team can start performing—that is, diagnosing and solving problems—and actually can have an impact on implementing changes. At this point, team members have discovered and accepted other members' strengths and weaknesses and have discovered how they can contribute. Members begin to develop insights into personal and group processes, and they are better able to identify productive process changes. The leader will know when the team has reached this point because the team now is able to accomplish significant progress. Understanding this normal pattern for maturing groups will keep the leaders from overreacting to normal problems and setting unrealistic expectations that only add to frustration. Many team efforts have failed because the leaders did not recognize this normal and necessary process. Teams have been dismantled because leaders were not seeing immediate results or were experiencing their own frustration with the process. It is often said that group decisions are far more effective than individual decisions, so leaders must allow the group to mature before the team concept can achieve its full potential. Abandoning a team approach to process improvement often can have far more detrimental effects than not having started the team in the first place. Abandoning a team during the maturity process can disillusion employees, squelch initiative, and create an atmosphere of distrust in the leadership. Leaders must recognize that teams have a normal roller-coaster of emotional highs and lows. With every step forward, the future looks bright and team members are optimistic. No matter how well a team works together, however, progress is never smooth. As progress swings from forward to stalled, and then from stalled to backward, the mood of the team will swing as well. The positive feelings of hopefulness and optimism may last for a while, but they usually change to boredom and impatience as the project gets under way and the team realizes how much remains on the road to success. The elation that results from certain stages of the process often can change to despair if the team does not understand these highs and lows of team dynamics. For example, often the initial data collection and analysis process uncovers mistakes in data collection procedures, and the team has to go back and do it again. At this point, the leaders need to provide encouragement. Improving each step of the change process is part of the process. If the data collection team determines that the process for gathering the data is flawed, the team needs to understand that this is a success. The flaw in the data-gathering process was not known until the data were gathered and analyzed. This step has pointed to a part of the process that needs to be improved to develop more meaningful measurement factors. Had the initial data not indicated a problem with the collection process, the problem would never have been uncovered—that is, the team cannot adjust something it is not aware of. The team occasionally will need the leader to reinforce this concept to respark the team’s emotional state. The maturity pattern and emotional state of each team is different. Guidance leaders need to understand and accept that changes in attitude, just like growth stages, are normal. The leaders and the teams must develop patience and persistence. Too many process improvement efforts have been abandoned in mid-cycle because these concepts were not fully understood. Abandoning a change process, just like abandoning a team, in mid-cycle can create disillusionment, squelch initiative, and create an atmosphere of distrust. Once employees reach this state of mind, it is difficult to encourage them to participate in another change initiative. Deming notes that lack of constancy is one of several deadly diseases that will stand in the way of any effective quality transformation effort. Anyone who has any experience working with teams will appreciate the difficulty in developing creative ways to approach a task. It is sometimes even more difficult to select only one or two items to focus on from all of the available options. Three of the most common techniques used by teams to ease this effort are brainstorming, multivoting, and the nominal group technique. Brainstorming is one of the easiest and most enjoyable ways to generate a list of ideas. A successful brainstorming process allows people to be as creative as possible and does not restrict their ideas in any way. This free-form approach can generate excitement in the group, equalize involvement, and result in original solutions to problems. The team needs to discuss the ground rules before starting the brainstorming process. Typical guidelines include the following: (1) there are no silly ideas, (2) think outside the box, (3) hitchhiking on someone else’s idea is perfectly acceptable, (4) no discounting of ideas, and (5) no discussion of ideas (there is plenty of time for that at the next stage). It is not uncommon for ideas that may seem totally unorthodox when first suggested to be the best solutions in the long run. Multivoting, also known as Pareto voting, is an effective method of reducing a number of ideas to the most important or popular. This is accomplished through a series of votes; each cutting the list in half. Even an extensive list of 30 to 50 items can be reduced to a workable number in four to five votes. Multivoting often follows a brainstorming session to identify the few items worthy of immediate attention. The process involves generating a list of ideas. If two or more items seem to be related, they should be combined, but only if the group agrees. Once all related items have been combined, renumber the items if necessary. The team then begins the voting process. The nominal group technique (NGT) is a more structured approach than brainstorming and multivoting to narrow down a list of options. This approach is called “nominal” because during the session the group does not engage in the usual amount of interaction typical of a real team. NGT is an effective tool when there are highly controversial issues or when the team is stuck in disagreement. The first step is formalized brainstorming, but this step is conducted in silence, with each member writing down their own ideas. When everyone is done, a facilitator goes around the table and allows each member to read aloud one idea off their list. Each idea is added to a flip chart. Discussion continues around the table until everyone has completed their list (or until a previously agreed-on time has expired). Once all of the ideas are listed, the facilitator asks if there are any questions about any of the listed ideas. This process is designed to allow the group to clarify and understand ideas on the list. Once this step is completed, the facilitator assists with combining similar ideas, but only with agreement from the originator of the idea. The next step is similar to multivoting, but again is more formalized and conducted by silent voting. Depending on the number of items to choose from, each member is allowed to select their top four to eight choices. These choices are then ranked in priority order. Once all members have voted, the votes are collected and tallied. The results of the tally will produce a Pareto-like chart that ranks the group's results. The group can then discuss the results. If there is agreement, then the process is complete and the group can decide what to do next. If there is continued disagreement, the group can focus on investigating the top two or three items that received the highest scores. It is important that team members understand the concept of consensus building. Consensus building is the process of finding a proposal acceptable to enough of the members that all can support it; no member opposes it. Consensus building is not a majority vote. Consensus building requires time; active participation by all team members; skills in communication, listening, conflict resolution, and discussion facilitation; creative thinking; and open-mindedness. To reach consensus, the team must allow each member to participate equally, and this may require several rounds of discussion and solution modification. Not all decisions require consensus, and it is probably impossible to have such agreement in any group, so the team should agree in advance as to when to push for consensus. When consensus building is required, the three techniques—brainstorming, multivoting, and NTG—can be effective structured ways to reach consensus. When teams are formed to assist with the change management process, they need to be aware of basic strategies of the scientific approach to problem solving. These steps include: understanding the process, collecting meaningful data, identifying root causes of problems, developing appropriate solutions, and making effective changes. The first step in any team process improvement effort is to understand the process. The team should understand how it operates, who is involved with what steps, what it is supposed to accomplish, who the customers are, and what the customers expect. Discussing these issues generally will help the team come to a common understanding of the process and its goal, identify any inconsistencies, and highlight any glaring problems. With this knowledge, the team will almost always be able to develop better procedures. Many mistakes or errors are related to the process, and these errors can be eliminated by making simple changes to a process. The team should take time to evaluate where the most common mistakes occur. The team can identify procedures that are less error prone by asking such questions as: Would changing the order of the steps prevent mistakes? Would changing a form prevent mistakes? Would using a checklist prevent mistakes? Or, would providing clear instructions that are graphically illustrated and prominently displayed prevent mistakes? The team should discuss whether changes in the work environment would be beneficial, such as changing the work layout or using a device that checks the completion of a procedure. The team should take time to be creative and think of entirely new procedures that are less error prone. Collecting meaningful data may be one of the most important strategies teams will use. Collecting unreliable data or developing poor collection methods can lead teams in the wrong direction, bring teams to the wrong conclusion, or fail to bring about the desired results. Collecting too much data can lead to analysis paralysis. Therefore, teams should take time to discuss why they are collecting data, what data will be the most meaningful, how the measured data will improve the process, and what process is the most effective for collecting the data. Meaningful data must be both consistent and stable. Data are consistent if two people who measure the same thing get essentially the same results. Data are considered stable when the results do not show signs of variation due to special causes. Ignoring these two concepts usually leads to wasted effort. Identifying the root cause of problems is essential for developing permanent solutions to problems. Sometimes it is easy to tell when a problem is first observed, but it is hard to know when it first occurs. At other times, employees may think a particular problem happens all the time, when in fact the specific cause of the problem is isolated. Jumping to conclusions without identifying the root cause of problems often leads to wasted time and resources. The team should spend time discussing the definition of the problem and studying the cause of the problem. The team may invite other people who have specific knowledge of the process to provide input. The more time spent understanding the cause and effect of the problem, the better the team will be at identifying the root cause. Statistical methods often are useful in this step of the improvement process. The crux of the scientific method is to develop solutions that really solve the problem. The only way to truly solve problems is to eliminate their causes. To develop effective solutions, the team may need to investigate various alternative solutions. The team should avoid jumping to conclusions, because it is common for people to assume they know the cause of the problem and the solution before they even start the process. All hunches must be supported by data, or they are not data-based decisions. There is value in having a “gut” feeling; however, if the gut feeling evolved based on erroneous data, it can lead to erroneous conclusions. In that case, meaningful and lasting solutions generally will not be developed. If the hunch turns out to be correct and is supported by data, the team invariably learns something about the process. More often, the best solution turns out to be something different than what was originally anticipated. The team should be patient and collect data on a variety of alternative strategies, and it should avoid simply charging ahead with what appears to be the best solution. Once special causes of variance are eliminated and the process becomes closer to statistical control, the team can discuss how it might make fundamental changes to the process to tighten the variance. After the team has identified the root cause of a problem and an effective solution, the next step is to implement the change. This may sound easy; however, the organization’s culture often can be the biggest roadblock to making effective change. The team should make certain to include the organization’s leadership in the plan, and identify the major sequence of events that are required to implement that plan. The team should look ahead, anticipate resources and training if necessary, discuss the best method to communicate and sell the proposed changes, and think about what to do if problems arise. By this time, the team should have a solid understanding of the process and should have eliminated the sources of problems from the process. Before bringing the project to an end, the team should develop a plan to make continuous improvement—a constant, never-ending part of the process. This may include keeping records up-to-date, monitoring key performance indicators (KPIs), and benchmarking. It is well known that it is difficult to manage something that cannot be measured. So how does the change leader identify current trends or areas that need improvement? What is available to help the leaders answer questions such as: Are we making adequate investments in our infrastructures to remain competitive? Are we making adequate investments in our resources to sustain excellence? Are we providing quality service? Are we providing an environment that creates employee satisfaction? Are we addressing the changes that drive actual or perceived performance excellence? Are we effectively utilizing available technologies? Are we changing with the times and doing so fast enough to keep pace? Various aspects of the facilities management organization can be measured to provide feedback to the change leader. Some of the relevant measures and indicators include facilities inspections and audits, financial and expenditure reports, operating costs, staffing ratios, and utility data. Other pertinent measurements include process KPIs, such as work order utilization, planned versus unplanned labor hours, schedule compliance, PM versus breakdown labor hours, storeroom turnover, and percentage of work order backlog. One way to stay current is to remain active, listen, and network. Active involvement with national and regional professional organizations, such as APPA, and attendance at education forums can provide valuable trend information. Participation in the APPA Thought Leader Series can provide invaluable insight into current and emerging trends. Networking with peers provides information on what others are doing, or how they are doing it. Reading trade journals, such as the Facilities Manager, or publications, such as Educational Facilities and the Impact of Technology, Expectations and Competition, an APPA Thought Leaders Series publication that includes the top 10 critical facilities issues, can provide information on current and progressive industry changes. More formal tools are available to the change manager as well. The Balanced Scorecard (BSC) is a tool that can be used to measure progress in various key areas and to ensure that change efforts align with the organization's strategic plan. Measurements using KPIs and benchmarks can provide both internal and external assessment of progress and status. An organization's strategic goals should provide the key direction for any change management effort. This alignment can be brought about by integrating programs like the BSC into the change initiative. For example, when deploying BPI or Six Sigma, projects can be identified on the basis of how they fit into the organization's BSC agenda. The BSC is a performance planning and measurement framework designed to execute and monitor the organizational strategy by using a combination of financial and nonfinancial measures. It is designed to translate vision and strategy into objectives and measures across four balanced perspectives: financial, customers, internal business process, and learning and growth. It provides a framework ensuring that the strategy is translated into a coherent set of performance measures. How is the department viewed by its customers? What must the department do to excel? Can the department continue to improve, change, and create value to remain effective? Is the department effectively utilizing its resources? These four stages should be representative of the organization's shared vision. Ultimately, these measures should help to communicate the organization's strategies and goals, motivate actions, and provide guidance and feedback for their attainment. Thus, for an organization to reap the full potential of the BSC process, it must first define its mission, determine major departmental objectives, and select strategic initiatives. The entire BSC design and implementation process easily can take up to two years or more, so it is critical for the organization's leaders to remain patient and persistent. Utilizing effective change management skills will help to guide the process. The financial perspective examines whether the organization's implementation and execution of its strategy are contributing to bottom-line improvement. This perspective can be used to evaluate the ability of the organization to manage its operations and costs. The customer perspective defines the value that the organization will apply to satisfy customers. The measures that are selected for the customer perspective should measure the value that is delivered to the customer, which may involve time, quality, performance and service, and cost. Fast-changing customer needs underscore the importance of aligning business processes to achieve higher customer satisfaction. It is imperative in any change initiative that the “voice of the customer” be heard, and factored in, when reviewing or redesigning any process. The internal process perspective is concerned with the processes that create and deliver value to the customer. It focuses on all the activities and key processes required for the organization to excel at providing the value expected by the customers both productively and efficiently. These can include both short-term and long-term objectives as well as incorporating innovative process development to stimulate improvement. This perspective measures internal processes for functions, such as operations management (improving asset utilization, supply chain management, etc. ), customer management (expanding and deepening relations), innovation (new products or services), regulatory (effective control and compliance), and social (establishing good relations with the external stakeholders). The learning and growth perspective is the foundation required for sustaining an organizational change culture. It focuses on the intangible assets of an organization that are required to support the value-creating processes. The learning and growth perspective is concerned with the jobs (human capital), the systems (information capital), and the climate (organization capital) of the enterprise. Christopher K. Ahoy suggested adding two additional perspectives: information technology and knowledge management. The information technology perspective is concerned with the all aspects of managing and processing information in an organization. It includes hardware and software, and internal and external applications. The knowledge management perspective is concerned with how everyone in the organization collects, disseminates, and analyzes pertinent data, information, and knowledge in a timely fashion for the benefit of the organization as a whole. It is important for the organization to understand that these various perspectives are not independent of each other. Performance drivers in one perspective may affect outcomes in other perspectives. An effective BSC can be the catalyst for stimulating and sustaining continuous improvement. It can serve as the starting point for an organization-wide performance improvement system that pinpoints each division's key contributions to the overall strategy. When used effectively, the BSC provides the framework for an organization to change its culture and the way it goes about doing business systematically and fundamentally. Change management tools place emphasis on measurable results. Accordingly, benchmarks and KPIs assume an important role in any change initiative. Depending on the life cycle of the process in question, benchmarks may be internal from within the organization, external from competing or noncompeting organizations, or dictated by the senior management of the organization as an aspirational target. KPIs are financial and nonfinancial metrics used to help an organization define and measure progress toward organizational goals. The key to organizational survival is to stay current by actively seeking and implementing best practices, both internal and external to the organization. Benchmarking can contribute directly toward this effort. Benchmarking is a process in which organizations evaluate various aspects of their processes in relation to best practice. This process allows organizations to develop plans on how to adopt such best practices. Used effectively, benchmarking can help organizations pursue continuous improvement by allowing them to continually challenge their practices. Benchmarking can help set realistic goals and strategic targets, while also creating a sense of urgency. It can help increase sensitivity toward the changes in the expectations or industry practices. Benchmarking differs from comparative cost studies, because comparative cost studies tend to measure against averages, not best practice. There are various kinds of benchmarking. Some of the most common ones include process benchmarking, performance benchmarking, and strategic benchmarking. In process benchmarking, the focus is on improving process capability, effectiveness, efficiency, or cost to enhance the final output. Performance benchmarking emphasizes the competitive position of an organization within its own industry, with a focus on metrics such as cost or quality. Strategic benchmarking seeks to identify the approaches that make high-performing organizations successful. This form of benchmarking is the most advanced and may require considerable resources and time, yet most breakthrough ideas come from this effort. Benchmarking can be accomplished internally or industry-wide. Internal benchmarking is the most basic level of benchmarking, and it analyzes the areas that are most successful within the organization with the goal of establishing similar factors in other internal processes. Industry benchmarking can be accomplished on an individual basis or in collaboration with other organizations. One challenge that benchmarking presents to the change leader is to prepare the organization for the fact that others may perform better. It is critical to communicate the message that because other organizations may be superior in some processes, it is not a negative reflection on the organization's ability, knowledge, or dedication. To improve, even an organization that is performing well must be able to come to terms with the fact that it will need to emulate best practices. Have a predefined business process. Have clear goals or performance requirements for the process. Have a quantitative or qualitative measurement of the results and comparison with set goals. Investigate variances and adjust processes or resources to achieve the desired goals. The APPA Facilities Performance Indicators (FPIs) survey is an annual collection and reporting of data (KPIs), creating a baseline for performance evaluation across education facilities. The FPI survey and resulting FPI reports take a comprehensive look at facilities' operating costs, staffing levels and expenses, building and space costs and usage, strategic financial measures, and much more to provide a benchmark by which related institutions can compare, contrast, measure, and elevate their facilities' performance. The dashboard feature (see figure 15) is a flexible tool for setting goals at various levels within an organization and organizing dashboards into BSC perspectives. 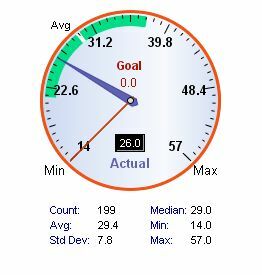 The dashboards overlay an institution's measurement scores onto dials with visual comparisons to overall averages. Goals can be inserted to show the future desired performance positions. The FPI report is an essential tool that can be used to achieve organizational excellence through continuous improvement. The FPI survey and report enable the facilities professional to assess an organization's financial performance, the effectiveness of its primary processes, the readiness of its employees to embrace the challenges of the future, and its ability to delight customers. The FPI report enhances the facilities professional's ability to develop and analyze solid information supporting organizational planning, reporting, operating, and change efforts. A number of assessment programs are designed specifically for the facilities management organization to guide the change process. Three specific ones are the (1) APPA Facilities Management Evaluation Program, (2) Reliability Management Group, and (3) Sightlines. The FMEP takes a system approach that includes seven section criteria and 57 subsections that are all part of a system that must be integrated to optimize organizational performance. The seven FMEP sections are Leadership, Strategic and Operational Planning, Customer Focus, Information and Analysis, Development and Management of Human Resources, Process Management, and Performance Results. Patterned after the Baldrige National Quality Program Criteria for Performance Excellence, the FMEP criteria provide a framework for continuous improvement. The criteria are designed to help facility management organizations use a comprehensive and integrated approach to organizational performance management, and provide a profile of strengths and opportunities for improvement. It is important to recognize that the work required to prepare for the FMEP is not an individual task. The best method is to involve a team or teams of people who have an interest in better understanding and using the FMEP criteria as a template for improving the organization. A team should consist of three to five members who represent employees from different levels throughout the organization. The team composition will vary depending on the particular criteria category. Large facilities organizations may have multiple teams, each evaluating different FMEP criteria. Smaller institutions may have only a single team to assess all seven FMEP criteria categories. The benefit of going through an FMEP is that the leadership of a facilities organization is required to review current practices. The process allows the organization to identify and make appropriate adjustment and improvements to overall effectiveness and efficiency. The result is an organization that improves quality and productivity, and ultimately provides improved customer service. The Reliability Management Group (RMG) offers a framework to guide the organization's change process. The work management process consists of six steps on what the organization refers to as “The Wheel.” The Wheel is RMG's graphic view of good reliability management. The sections of The Wheel are the Pain Zone, the Productivity Zone, Joint Prioritization, Daily Schedule Compliance, Collect and Utilize Data, the Proactivity Zone, Problem Solving, and Work Culture. The Pain Zone is emergency work that is the most expensive type of maintenance. The Productivity Zone is where productivity is created by planning and scheduling work. Joint Prioritization is teamwork between departments such as Operations, Maintenance, Engineering, and Materials that together decide the order in which work should be accomplished. Daily Schedule Compliance is the most important measure in maintenance because it identifies both equipment reliability and work process reliability. Collect and Utilize Data is a critical step in the improvement process. The Proactivity Zone consists of various technologies or procedures that identify work early to skip the Pain Zone. Some of the most common processes include preventative maintenance (PM), predictive maintenance (PDM), condition-based maintenance (CBM), reliability-centered maintenance (RCM), and total productive maintenance (TPM). Problem Solving consists of work documentation, work measurement, and work analysis. Work Culture surrounds and affects every part of the entire process. The RMG Wheel correlates directly with the Deming Cycle of PDCA. RMG's Reliability Grid is a detailed, comprehensive framework for assessing the Reliability Process. The grid parallels the work management process and “The Wheel.” The grid has 88 cells and 491 criteria that comprehensively describe the characteristics of a low-cost, reliable work management process. The grid is a useful tool that brings objectivity and order to an often subjective and chaotic process. If used to its full potential, the grid leads to a thorough understanding of the work management process and the organization's work culture. This can be a useful tool to guide the change process by defining what is, what can be, and how to get there. Sightlines also uses a process that follows the PDCA cycle. Sightlines states that its goal is to enable colleges and university business officers and facilities leaders to manage the physical assets of a campus with the same analytical rigor with which they manage their financial assets. Sightlines has created a proprietary process to measure and monitor the performance of physical assets on college and university campuses to guide the change process. The firm refers to the process as the Return on Physical Assets (ROPA). The ROPA process was developed to illustrate the interrelationships among four key aspects of facilities management: asset reinvestment, annual stewardship, operating effectiveness, and customer service. Using the Sightlines measurement approach, an organization can transform data into action items. They transform data on 170 indicators into information by applying a QVQ (Quantify, Verify, Qualify) process. This information is transformed into knowledge by applying the ROPA model along with benchmarking to illustrate trends and opportunities. The knowledge gained from the ROPA model is then integrated with institutional long-range program and financial planning to identify action items. The Sightlines model can provide independent validation of organizational strengths and weaknesses and can discover the root causes for under-performing areas. Lasting change starts with planting a seed early on in the process. The cumulative effect of nurturing that seed as it grows will determine whether change becomes rooted into the organization's culture. Sustained change is not something that happens once change has been implemented. Planting and nurturing the change seed may involve organizational changes. Change will likely involve redesigning the roles people play in the organization. Behaviors and attitudes are formed by the context of roles, responsibilities, and relationships. Change may require that the organization's structure be redesigned. Who plays key positions in the process can have a strong signaling effect. Individuals most willing to adopt change should be put into lead roles, either formally or informally. Many individuals who are not in formal leadership roles can be effectively utilized to lead change processes. Change may require that resources be realigned to emphasize the goal. Reward systems must be redesigned as well. Rewards must include public recognition of behaviors that are consistent with the desired change. This both reinforces the desired behaviors and sends a strong message to others. Who gets the praise and recognition? Who gets promoted and why? Is team effort really a value? Is initiative recognized and appreciated? These are all important questions that must be reinforced throughout the change process. One of the most powerful messages is for leaders to reinforce what they truly care about. Change leaders must take an active, visible role in the change process. Active participation, support for organizational redesign, resource allocation, and effective reward programs all indicate the level of credible commitment. People need to see deeds and actions. Simply communicating the desired goals will not have a lasting effect. Change leaders must demonstrate a high level of interest in measurement. This includes performance measurements, benchmarking, attitude surveys, focus groups, and individual interviews. A balanced measurement program must track short-term and long-term performance indicators, as well as internal and external perspectives of stakeholders. These indicators will help assess whether the organization is doing the right things in the right ways. Take time to celebrate. Change efforts may take many years to become fully integrated into the organizational culture. This can test the patience of internal and external stakeholders and can increase the likelihood of skepticism. There is often no better motivator than celebrating frequent successes. It can keep hopes alive and rejuvenate those who have invested extra effort. Celebrating success can enhance the credibility of the program. It is important during the celebrations not to declare victory too soon. While it is good to celebrate short-term wins, the long-term success is the higher, overarching goal. The goal is to win the war, not the battle. The possibility of regression to prechange practices has a strong pull. Continuous refining and retuning of the process must become a cultural norm. The outcomes of change initiatives are not always fully anticipated. In some cases, there are totally unanticipated outcomes. In turn, conditions that presented the need for change are constantly changing. It is important for the change leader to communicate and reaffirm that these adjustments are consistent with the original initiative. Some change efforts may fail, but a failed change effort may provide far more information than an unproductive success. For example, people sometimes can learn more about math by learning from their mistakes. It is up to the leaders to make sense of what is going on and to retell the story so that it is consistent with the desired values and core principles. Successful change leaders actively look for ways to obtain clear performance improvement, establish goals, determine milestones, achieve the stated objectives, and reward the people involved. Continued achievement, celebration, and communication will encourage teams to continue with the effort required to make long-lasting improvements and to develop an organization that is built to change. After successfully implementing a new work order management system, the University of Colorado at Boulder Facilities Management Department proceeded with the next step. This step involved reviewing the organizational practices to promote effective asset management, improve customer service, and capture opportunities for improvement. 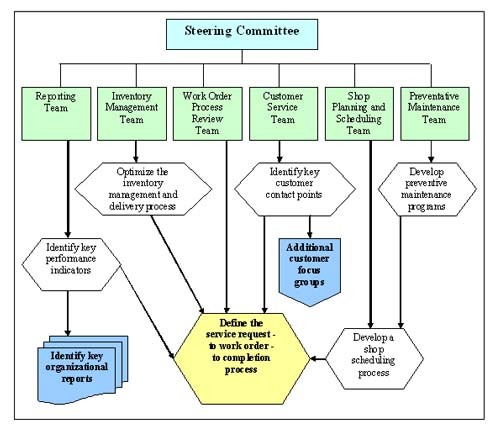 To accomplish this goal, Facilities Management developed an Operations Steering Committee (see figure 16) that guides a number of subcommittees: a Work Order Process Review Team, a Shop Planning/Scheduling Team, a Customer Service Team, an Inventory Management Team, a Preventative Maintenance Team, and a Reporting Team. Each subcommittee is composed of cross-sectional employees who coordinate their given charge. The Steering Committee discusses the unit's mission and vision, monitors subcommittee progress, assists with removing barriers identified by the subcommittees, determines priorities, and coordinates to align the subcommittee interactions since all team missions overlap. The Steering Committee ensures that the subcommittee efforts align with these objectives. The Work Order Process Review Team is charged with reviewing the entire work order process from the initial service request to the final service delivery, work order closure, and customer contact. This process is the foundation for the facilities operations change process and requires coordination with all the other teams. The process requires information on the work order, such as who made the request, who was assigned, what materials are needed, status of the request, and work order metrics. The team developed a detailed flowchart to view the various steps in the process. The team recognized that the work order management process was actually a system made up of numerous processes. The team divided the system into various processes to focus on specific stages without becoming overwhelmed. Work order management requires training internal service providers on how to complete accurate work order status, work order metrics, and timely entry. To keep customers posted on progress and to issue timely billing, it is necessary for the service providers to provide accurate daily time cards and work order status. Future analysis for metrics such as percentage of labor hours spent on various priority codes, worker productivity, and percentage of work dedicated to various activity codes is only as accurate as the information from the service providers. The Shop Planning/Scheduling Team focuses on how work is planned and scheduled. The goal is to plan service requests to notify customers of the service delivery time and date. Customers often feel that their request fell into the void, or that they have to shut down their processes for the service request to be completed. Knowing the workload and available resources allows for better planning and improved service delivery. The process also organizes work order requests and reduces the work order backlog. Planner schedulers also review the work orders for metric accuracy and work order notes required to inform customers of service status or actions. This team reviews concepts such as a centralized work control center versus a distributed system. Currently, the system utilizes a distributed concept in which the planner schedulers reside in the respective shops. The Customer Service Team focuses on contact with the customer. The team reviewed the work process flowchart and inserted key customer contact points. Processes were developed and are being refined to keep customers informed on the status of their request. Customers are encouraged to enter their request electronically though the facility's Web site. This allows customers to track the status of their service request at key steps, such as schedule date, parts or materials on order, work completion, and work order closure. Customers are encouraged to complete a service satisfaction survey upon completion of the service request. The Customer Service Team also meets with smaller customer focus groups. With the input from this interaction, the team is able to advise the Steering Committee on process changes that may be needed to meet and anticipate changing customer needs and expectations. The Inventory Management Team focuses on the optimal management of the working capital necessary to maintain the warehouse inventory. This team coordinated with suppliers to improve optimal material delivery and reduce the on-campus storage requirements. Materials such as filters and custodial products are bulky, so improving the delivery schedule reduces the need for on-campus storage space. Coordinating with various suppliers to standardize materials reduces the need to have multiple contracts and allows for the development of partner relationships that continue to look for improvement opportunities. The team focuses on metrics, such as the optimal reorder point, to improve stock turnover times to optimize the need for working capital. The team worked on reducing unaccounted-for inventory that over time built up in the shops, and plans to address such issues as the optimal level of bench stock and traveling inventory that resides in various service vehicles. The team worked on improving the electronic catalog to help service providers identify and order necessary parts to reduce the "counter" time. Nonstock items are coordinated through and acquired by material handlers to improve the shop productivity levels. The Preventive Maintenance (PM) Team focuses on creating a proactive maintenance approach to maintenance. It was clear from the beginning that this process would require a significant business process improvement approach as opposed to incremental improvements. As a result, there was a major reorganization of the Trades Shops to create a PM Shop that focused only on PM activities. The PM Shop receives no customer-driven service requests, but proactively plans and schedules PM activities. The PM Team worked on identifying and labeling all of the major equipment, and identified service tasks and service frequencies. This information was entered into the work order management system. Parts and materials lists were developed and attached to the work orders so that parts delivery could be anticipated and ready once the work is scheduled. The PM Team identified level 1 PM tasks (such as filter changes, coil cleaning, lubrication, and changing fan and motor belts) and level 2 PM tasks (such as chiller tube, fire hydrant maintenance, storm line cleaning, and steam trap maintenance) to identify and assign tasks to the appropriate resources. Within the first three years, reductions in breakdown maintenance were already evident. The Reporting Team initially worked independently to gather the information needed to participate in the APPA FPI Survey. A consulting firm was contacted to assist with the data analysis, in conjunction with use of the APPA FPI webinars. To provide consistency, the team worked on describing the various action codes or work types (PM, Breakdown, Repairs, Inspections, etc.) that were going to be used. Once that task was accomplished, the team started working on short-term KPIs to help shops assess their progress and develop short-term wins. This required working with the Work Process Team to identify key measurement points. The KPIs being monitored include shop productivity (billable hours verses total available hours), monthly hours spent per shop by action code, PM work orders opened and closed, and total number of work orders opened and closed. The data provided by the prior code report indicated that more than 95 percent of the requested work could be performed within 3 to 15 days after the service request was issued. This supports the concept that the work could be adequately planned and scheduled. The Reporting Team is gathering information necessary to benchmark against peers and assess the effectiveness of the allocated resources. The various APPA staffing guideline manuals for maintenance, custodial, and grounds are used to determine existing staffing levels and to request funding for new facilities. As the various pieces of measured information come together, the team will be able to provide a comprehensive report to the administration on the state of the department and the institution related to asset management. Because the change initiative is envisioned to be a continuous effort, the Steering Committee has had to discuss the concepts of patience and persistence. This team, like any other team, experienced the various stages that teams go through during the change process. Knowing these stages helps the Steering Committee stay focused, even during the down part of the roller-coaster ride. There has been some anticipated resistance to change, but by embracing the concepts of patience and persistence, there have been noticeable improvements. Customers have commented that they notice a difference, and more employees are joining the effort. Changing the culture of the organization to be more proactive and customer focused has been a journey, with its challenges and rewards, and by staying committed, the department will be able to be proud of its accomplishments. Adams, Cary W., Praveen Gupta, and Charles E. Wilson. 2003. Six Sigma Deployment. Burlington, MA: Butterworth-Heinemann. Ahoy, Christopher K. 2007. Leadership in Educational Facilities Administration. Alexandria, VA: APPA. APPA. 2007. Creating a Service Culture: Making the Customer Connection. Alexandria, VA.
Baldrige National Quality Program. 2008. “Criteria for Performance Excellence.” Gaithersburg, MD. Booth, Nate. 1997. Strategies for Fast-Changing Times: The Art of Using Change to Your Advantage. Rocklin, CA: Prima Publishing. Breyfogle, Forrest W, III. 1999. Implementing Six Sigma: Smarter Solutions Using Statistical Methods. New York: John Wiley & Sons. Bridges, William. 1991. Managing Transitions: Making the Most of Change. Reading, MA: Addison-Wesley Publishing Group. Collins, Jim. 2001. Good to Great. New York: Harper Business. Covey, Stephen R. 1989. The 7 Habits of Highly Effective People. New York: Simon and Schuster. Covey, Stephen R. 1999. Living the 7 Habits. New York: Simon and Schuster. Deming, W. Edwards. 1986. Out of the Crisis. Cambridge, MA: MIT. Gerson, Richard F. 1998. Beyond Customer Service. Boston: Thompson Learning. Gerstner, Louis V., Jr. 2002. Who Says Elephants Can’t Dance: Inside IBM’s Historic Turnaround. New York: HarperCollins Publishers. Hammer, Michael, and James Champy. 1993. Reengineering the Corporation: A Manifesto for Business Revolution. New York: HarperCollins Publishers. Hug, Jack. July/August 2006. “Getting Started with the Facilities Management Evaluation Program.” Facilities Manager 22, no. 4: 45–50. Kaplan, Robert S., and David P. Norton. 1996. The Balanced Scorecard: Translating Strategy into Action. Boston: Harvard Business School Press. Keller, Paul A. 2001. Six Sigma Deployment: A Guide for Implementing Six Sigma in Your Organization. Tucson, AZ: Quality Publishing. Kotter, John P. 1996. Leading Change. Boston: Harvard Business School Press. Kouzes, James M., and Barry Z. Posner. July/August 2008. “It's Not Just the Leader's Vision.” Facilities Manager 24, no. 4: 22–23. LaMarsh, J., and R. Potts. 2004. Master Change, Maximize Success. San Francisco: Chronicle Books. Leban, Bill, and Romuald Stone. 2008. Managing Organizational Change. New Jersey: John Wiley and Sons. McAlary, Chuck K. May/June 2001. “Cultural Change and a Balanced Scorecard: Does Your Organization Measure Up?” Facilities Manager 17, no. 3: 39–43. Palmer, Ian, Richard Dunford, and Gib Akin. 2009. Managing Organizational Change: A Multiple Perspectives Approach. New York: McGraw-Hill/Irwin. Padesky, Jay. February 2006. “Part 1: A Corporate Scorecard: Tracking KPIs Across Multiple Plants and Business Units.” Maintenance Technology. Padesky, Jay. March 2006. “Tracking KPIs Across Multiple Plants and Business Units.” Maintenance Technology. Pyzdek, Thomas. 2003. The Six Sigma Handbook: A Complete Guide for Green Belts, Black Belts, and Managers at All Levels. New York: McGraw-Hill Professional. Qayoumi, Mohammad H. 2000. Benchmarking and Organizational Change. Alexandria, VA: APPA. Scherkenbach, William W. 1988. The Deming Route to Quality and Productivity: Road Maps and Roadblocks. Washington, DC: CEEP Press Books. Scholtes, Peter R. 1988. The Team Handbook: How to Use Teams to Improve Quality. Madison, WI: Joiner Associates, Inc.
Scott, Cynthia D., and Dennis T. Jaffe. 2006. Change Management. Boston: Thompson Learning. Sightlines Promotional Material, www.Sightlines.com. Madison, CT.
Smith, Glenn R. July/August 2006. “Covey, Deming, Senge: Dealing with Radical and Uncertain Change.” Facilities Manager 22, no. 4:37–42. Stephens, Michael. December 1997. “Reinventing the Wheel.” Maintenance Technology. Walton, Mary. 1986. The Deming Management Method. New York: Dodd, Mead and Company. Whittaker, James P., P.E. September/October 2005. “Facility Asset Management: Asset Management Performance Measures.” Facilities Manager 21, no. 5:62–63.